Notes about about ABC No Rio in Spanish, with some excerpts in English. March 2, 2012. 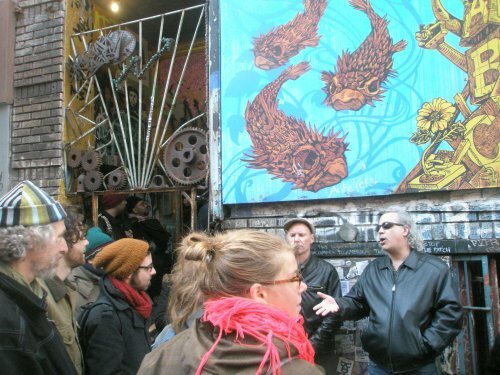 Notes on legalization of squats in NYC, in Spanish with some quotations in English, among them an interview with Frank Morales. March 3, 2012. Also, we have just uploaded to N+1 SQEK website the following document: “AAG session abstracts for February 2012 SQEK-organized sessions”. This is all the published abstracts for the sessions organized for SQEK at the Association of American Geographers Annual Meeting in New York City, Friday, 24 February, 2012. The sessions were entitled “Squatting and Social Centers: Resistance and Production of Critical Spaces” (5 sessions, 8am-6:20pm). All abstracts were culled from the AAG conference website. 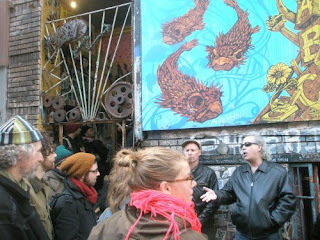 Photo: Steven Englander, director of ABC No Rio, in front of the building talking to SQEK members. Next to him is Matt Metzgar, organizer of the Squatter Rights Archive at Tamiment Library. Photo by Miguel Martinez.